Alice Springs student Kelly Hoban is moving to Los Angeles after securing work as a travel consultant with Jetabout Holidays. The 26-year-old is in the first group of Alice Springs students to graduate from the Bachelor of Business in Tourism Management course at Charles Darwin University. She has studied tourism and hospitality since her student days as a VET in Schools (VETiS) student. A travel consultant at Territory Discoveries, Kelly has been completing her studies in a mix of full- and part-time modes. 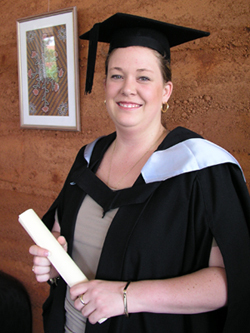 After completing Year 12 at Centralian College, she left to complete an Advanced Diploma in Hospitality Management at Regency TAFE in Adelaide, returning to Alice Springs in 2001. ‘I realised the huge career opportunities available to me in the Northern Territory and decided to return,’ she said. After working in hospitality in Alice Springs, Kelly commenced her higher education degree and joined Territory Discoveries. She originally heard of the job in America after a colleague applied to Jetabout USA. ‘I emailed my resume and a few weeks later was flown to Sydney for an interview and was offered a job,’ she said. She secured work in the US through a visa program that allows her to work for 18 months. Kelly heads off to Los Angeles this month after an education tour of Queensland, NSW and New Zealand. Morag McGrath, head of the School of Hospitality, said Kelly was a committed student who had been presented with a wonderful opportunity to work in the US.